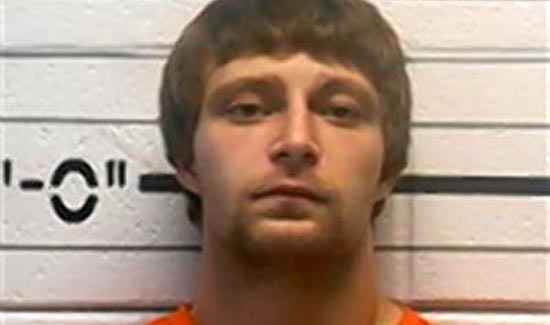 Jonathan Grafton, 22, is wanted in the murder of his father and an Oklahoma police officer. An Oklahoma couple is wanted in the murder of a police officer and the male suspect’s father in a Midwest City motel room on Saturday night, police said. Lt. Trey Pritchard and his cousin, Jeffrey Grafton, both 46, tracked Grafton’s pickup truck to a Traveler’s Inn in the town in the Oklahoma City area, where police said Grafton’s son had driven it without permission, The Oklahoman reported. Midwest City police believe the two men went into a room at the motel with Jonathan Grafton, 22, and his girlfriend, Daphne Mason, 21, to ask them about the truck and never came back out, according to Tulsa World. Officers found both men dead in Room 238 at around 10 p.m. on Saturday night, KFOR-TV reported. I really hope this coward gets tracked down and taken into costudy ASAP! I HATE COP KILLERS!